Former Frontier Casino owner Phil Ruffin says "He's putting his money on Vegas." This is to the tune of $775 million to purchase Treasure Island from MGM Mirage. The deal is said to involve $500 million in cash, with the balance in secured notes. The transaction is expected to close around the 2nd. quarter 2009, pending regulatory approvals. This gives MGM a liquidity boost in these difficult economic times. It's also a boost to City Center that is scheduled to open late 2009, as the credit markets having tightened, this inflow of cash gives them some breathing room. It also shows a substantial vote of confidence in Las Vegas, to have an investment like this with all the negativity still in the air. 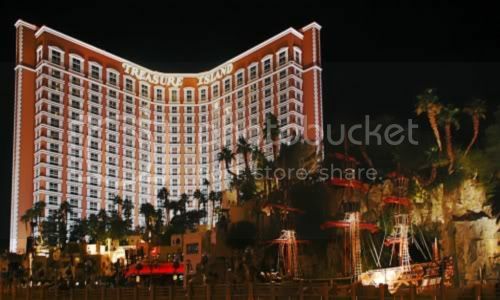 Phil Ruffin sold the Frontier to ELAD Group in 2007, which then partnered with IDB Group to build a Las Vegas version of New York's Plaza Hotel on the site. The project has been delayed by a dispute over the Plaza name, which has since been settled, and of course by the tightening of the credit markets. Although delayed, it appears at the moment that they are proceeding with the development, and are asking for a second extension of time on their loans while they finish their preparations and obtain construction financing. So where does the Canadian invasion of Las Vegas tie into all this? A number of ways, actually. First, they have been the dominant buyers of MGM's City Center condominiums. An article from the Calgary Herald earlier this year even quotes City Center's Toronto based residential division executive VP, Tony Dennis. "The dominant buyers are from Calgary and Edmonton because of the travel time involved," he says. "Canadians, especially Western Canadians, have always liked Vegas. It's so close." IDB Group, the 50% partner in the Las Vegas Plaza, has other investments here in Las Vegas. One of them is luxury condominiums of One Queensridge Place in Summerlin, and the surrounding development that includes the mixed use Tivoli Village. They have recently increased their investment in the project. Frank Pankratz, a native of Saskatchewan, is the president of Executive Home Builders, the developer of Queensridge and IDB's partner. He too is quite optimistic on investing in the future of Las Vegas. A report in Ontario's National Post that describes his experience and views on the Las Vegas real estate market, titled Vegas Rising. While not related to this group of developers and investors, just one more area where a substantial number of Canadians have purchased here in the Las Vegas Valley. I mentioned it in a past blog about Tuscany Village in Henderson. The golf course centered community has been a popular spot with our neighbors from the north. It seems that many are finding Las Vegas an excellent investment opportunity these days. I'm sure Phil Ruffin feels that today's market opened an opportunity to purchase the TI at an exceptional price. For home buyers they may find the same. Recent analysis from National City finds Las Vegas homes 18.8% undervalued, with them suggesting that this presents opportunities to home buyers, but not 'flippers'. Another article from the Las Vegas Review Journal suggests that Las Vegas home prices may be at or near bottom. It's based on local real estate sales data, and from Foreclosures.com. The president of the foreclosure tracking company sees a slowing of foreclosed properties in Las Vegas, and further stating that a recovery is underway, and they predict that buyers will be appearing in droves through 2009. I find it good to see this strong interest, investment, and support of the potential in Las Vegas, especially when still in these unsettled economic times. I have said it before and I will say it again... one of the few constants in Las Vegas seems to be change. I guess that is a part of what keeps the city so exciting and vibrant! Steve: Exactly why. There's always something new and different to check out. I think that's why there's so much interest from these developers and why they feel a rebound is only a matter of time. You are so right, Roberta! The Canadian interest in our fair city is astonishing. Literally, about 3 out of every 5 investors I have been working with in the past 6-8 months or so have been Canadian nationals. Many of the other people I talk to that work here are experiencing similar numbers. I can't blame them, we really have some once in a lifetime buys happening right now. Ruffin made another super deal and I think it will be good for all. Puts another independant back on the strip and with such a good buy he can keep prices competitive as the economy recovers. I didn't know about all the Canadian activity here or how all those projects tied together and the strong commitment to Vegas. Good to know! Really liked the look of Queensridge it's a sharp looking design and a nice pic of it with Suncoast. Mike: Yes there are a large number of Canadian buyers in the market, and it seems many are having a high percentage of clients from our neighbors north of the border. Maybe they know a good value when they see it, like Phil Ruffin! Bob: Ruffin was quoted as saying he may not have bought at the bottom, be he's close. I think he's dead on with that. It would be difficult to impossible to build a near 3000 room property for that amount, let alone one with established cash flow / business. It helps MGM's position, and some competitive values for visitors while the economy recovers sure won't hurt either. As you can see above, I'm not alone with the Canadian neighbors. One Queensridge Place is a very beautiful design... and that 'in house' photographer of mine couldn't resist grabbing that shot. Question about Buying or Selling a Home in Las Vegas? Just Ask! Is Las Vegas Running Out of Water - Draining Lake Mead?